Join us for a memorable evening to celebrate social work. Starting at 6 p.m., you can enjoy hors d’oeuvres and cocktails from the cash bar. The program and dinner will begin at 7 p.m. with a call to action by long-time organizer and activist Rubén Castilla Herrera. Together, we'll celebrate exemplary social workers and recharge with a performance by "The Freedom Choir" who sings music of struggle and victory in the quest for justice. We’ll wrap up by 9, but in case you want to stick around, we’ll have a live salsa band for your enjoyment! The Location: The Columbus Athenaeum, a beautifully restored urban palace located in the heart of downtown Columbus. After the event, you can sleep in style at The Renaissance Downtown for $169. Book online by March 8 or call 877-901-6632 and ask for NASW Ohio Chapter room block. Details: Wear your best outfit and bring your dancing shoes! Cost is $50 per ticket (includes hors d’oeuvres and plated dinner) and all are welcome to attend. To reserve a table or sponsor the event, please click the link to see the table packages. Rubén Castilla Herrera is a second generation Mexican-American born in Seguin, Texas. He spent his childhood as a migrant farmworker in California, Oregon and Washington. He graduated from Willamette University in Salem, Oregon and attended the Methodist Theological School in Delaware, Ohio. Herrera is a long time organizer and activist fighting for justice, freedom, dignity and liberation for all people. 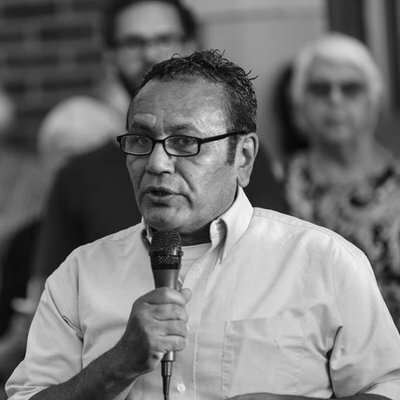 He was founding member of several Latinx related organizations including the Hispanic Chamber of Commerce of Central Ohio, Educators in College Concerned with Moving Hispanics Forward, the Central Ohio Worker Center and most recently, the Columbus Sanctuary Collective (Colectivo Santuario de Columbus). He has served as the Ohio-Kentucky-Indiana Regional Director of the A World of Difference Institute, a diversity education program and as founding Executive Director of City Year Columbus. He also served as faculty coach for the Center for Progressive Leadership, an organization to build, support and assist young leaders in the state of Ohio. Herrera began working on issues of immigrant rights as State Director of Reform Immigration for America, a national organization fighting for comprehensive immigration reform. He worked in Arizona in 2010 organizing against anti-immigrant legislation SB 1070 and in Georgia fighting HB 87. He has been arrested on separate occasions for civil disobedience fighting for immigrant rights in Georgia, Arizona and Washington D.C.
Herrera is currently an organizer with the Columbus Sanctuary Collective–Colectivo Santuario de Columbus (CSC) organizing around Sanctuary as Resistance and the #AbolishICE movement. The CSC is a faith-based strategy to stop deportations and a unified resistance to Immigration and Customs Enforcement (ICE). Herrera is a speaker, blogger, and writer. He makes several presentations in Ohio and throughout the region. Herrera lives in Franklinton (The Bottoms) in Columbus, Ohio with his partner Nicholas Pasquarello.